Rebecca Butala How/Getty ImagesJetBlue has canceled more than 400 flights on Wednesday and Thursday. By Wednesday morning, the latest nor’easter had resulted in more than 4,500 canceled flights through Thursday. Airports in New York, New Jersey, and Philadelphia have been the hardest hit. American,Republic,JetBlue, and Southwest Airlines have canceled more than 400 flights each. One day after the official start of spring, the fourth winter storm to hit the US in three weeks is causing airlines to once again deal with a round of mass cancellations. As of Wednesday morning, when the latest nor’easter had begun dumping snow in the Northeast, airlines have canceled more than 4,500 flights scheduled for Wednesday and Thursday, according to the flight-tracking website FlightAware. 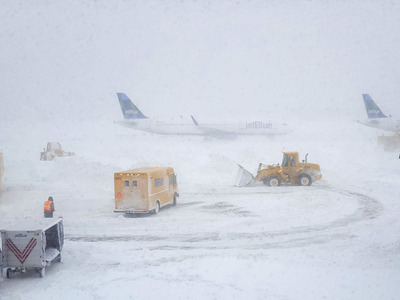 Airports in New York, New Jersey, and Philadelphia have been the hardest hit, as they have been involved in more than 2,500 canceled flights. LaGuardia Airport and Newark Liberty International Airport have seen over 60% of their scheduled flights for Wednesday canceled, while John F. Kennedy International Airport and Philadelphia International Airport have had over 40% of their scheduled Wednesday flights canceled. Among airlines, American, Republic, JetBlue, and Southwest Airlines have each canceled more than 400 flights between Wednesday and Thursday.